This project unites sustainable design and functional efficiency with four key elements of traditional Chinese architecture that are here repositioned for the 21st Century. These elements are: Layering; Texture; Infiltration; and Decoration. This design solution features a thoughtful interplay of the iconic volume that rises from the northern boundary of the site, and the smaller almost vernacular "retail village" at its base. The main tower presents an iconic image. Its multi-layered elevation, with traditionally inspired screen elements that provide solar efficiency and significant privacy, creates a uniquely harmonious and appropriate statement. 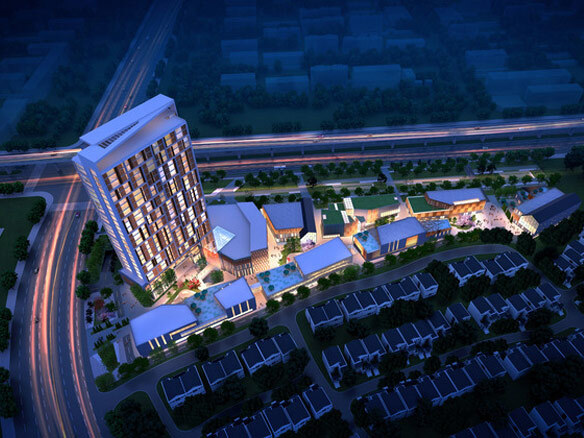 The tower's elevation expresses the carefully planned functions within. Its base features main entrance, retail, and above those the hotel functions; while at the upper half of the tower are residential condominiums. In the tower and lower buildings, the playful reflections on water, integral to so much traditional architecture in Wuxi, is rendered architectural with contemporary materials such as terra cotta screens, corten steel, and copper panels.